Learn digital painting : Rhoda Draws! Learn digital painting technique from critically acclaimed books featured on the Corel website and written by….ME! Using Corel Painter software and a WACOM tablet I have been creating unique digital artwork one brush-stroke at a time for 23 years. With Corel Painter software, a pressure sensitive tablet from Wacom Technologies, and a reasonably powerful computer, you can imitate virtually any “natural” media. Then just buy one of my books and… practice, practice, practice. Start by scribbling, so you can get familiar with the Wacom tablet and learn to manage the brushes, colors, textures and other art, materials available in Painter. Then do a simple drawing of a pear using Painter’s tracing paper feature. You’ll move on to basic landscapes and city scenes. Advanced projects include illustration, life drawing, portraiture and abstract painting. By the time you finish my Painter book you will have learned the principles of pixel-based digital art and mastery of Painter’s essential features. You will also have developed many fundamental skills needed for drawing and painting in any medium. 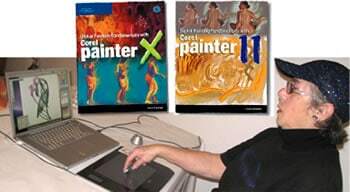 See sample pages from my Digital Painting Fundamentals with Corel Painter books on Amazon.com. Want to see a live digital caricature artist in action? Hire Rhoda Draws a Crowd! to entertain at your event.